This category recognizes stormwater retrofit projects that improve the runoff reduction and pollutant removal capability of existing stormwater BMPs constructed in the last five years. Retrofit sharply increase the water quality and/or quantity functions of the pre-existing stormwater facility (some documentation of estimated pollutant reduction should be provided). Below you will find information about the winners of the Best Retrofit BMP category of the 2017 BUBBAs. This project involved the installation of an innovative system of water quality treatment facilities to reduce nutrient and bacteria loads and decrease flooding in a Virginia neighborhood. 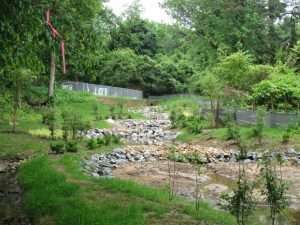 The three phase project consisted of a bio-retention swale and two regenerative stormwater conveyance channels installed across four private properties. 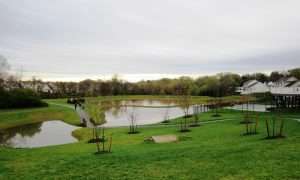 In addition to the water quality benefit, the project restored wetland functions, provided an aesthetic improvement and reduced property flooding. To read a full narrative and view more photos, please visit the project folder on our Google Drive. This project involved the retrofit of an existing wet detention facility by diverting stormflows from a local stream into a wet extended detention facility, while still maintaining base-flow in the existing stream channel. The retrofit significantly enhances the water quality and quality functions of the existing stormwater facility in a very cost-effective manner, while still offering an aesthetic improvement. This project involved a retrofit of a wet pond with an innovative technology called Continuous Monitoring and Adaptive Control (CMAC). 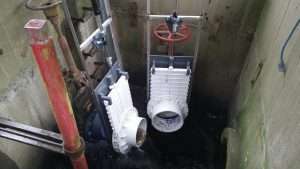 This creative and cost-effective solution greatly enhances water quality treatment using water level sensors that help to adaptively control the pond’s outlet valves, optimizing performance for a wide range of rainfall events.